Come check out the new Fighter Royale build, only for this weekend (May 4-6). Go to https://FighterRoyale.com and join us! How often have you ended up in the ‘chute with nowhere to go? Here’s your chance to make it worth it! In this special event arena, you will be on the daylight Archipelago map. The challenge will be to locate the Fox@FB and then eject from your perfectly good plane! While in your ‘chute, you can use your joystick or keyboard commands to correct the drift so that you land on top of the Fox! You’re in for a surprise the first time you hit him! The fly button is disabled until the beginning of the event. When the fly button becomes active, you may join the arena. Eject from your plane and guide your chute to land ON the Fox! You must land ON the Fox in order to get credit for the kill! Close doesn’t count in this event! Scoring is kept by the Fox@FB, and is verified from the game log. The first person who successfully targets the Fox with his chute is a winner! Additionally, the person who hits the Fox@FB the most times will also be a winner! Multiple sorties may be run. Announcement of winners will be at the end of each sortie and will be posted to the Fighter Base Facebook page! Red Rover! Red Rover! Come on over! Battle of the Hosts is a special event arena that utilizes the Menorca map. Participants will be instructed to choose between two countries. Your mission in this event is to protect the Target@FB who flies with your country. Protect his six and guide him safely to the enemy runway! Join one of the two countries. Please try to balance the teams. Stay on the runway until the Host@FB gives you the signal to take off! 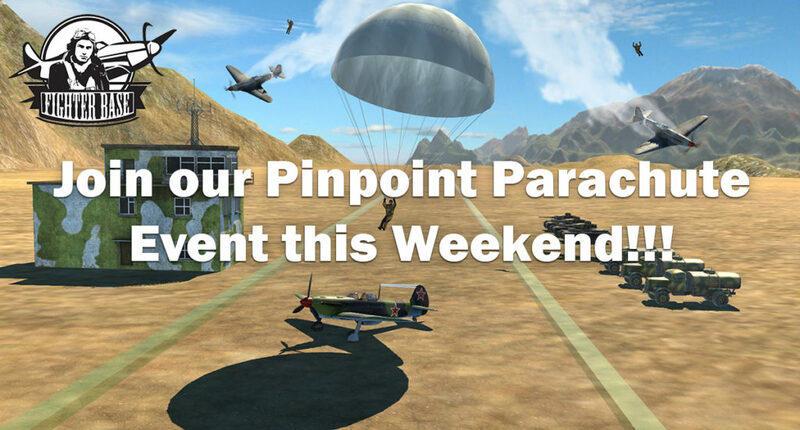 Fly close to the Target@FB of your country so that you can fend off the enemy planes trying to shoot him down! OR, you can attack the enemy and attempt to shoot down the opposing Target@FB! The targets will report successful takedowns (worth 500 points each) and landings (worth 1000 points each) in the chat, so your effect on the outcome will be noted! At the end of the sortie, a tally of the scores will be made and the winning team will be announced. There will be two sorties of 30 minutes for this event. The military history of the United States in World War II covers the war against Germany, Italy, Japan, starting with the 7 December 1941 attack on Pearl Harbor. During the first two years of World War II, the United States had maintained formal neutrality while supplying Britain, the Soviet Union, and China with war material through the Lend-Lease Act which was signed into law on 11 March 1941, as well as deploying the U.S. military to replace the British invasion forces in Iceland. U.S economic sanctions on Japan as part of the effort to deter Japanese military aggression in Asia and the Pacific outraged the Empire of Japan as the major cause of Japanese attack on Pearl Harbor. During the war, over 16 million Americans served in the United States Armed Forces, with 290,000 killed in action and 670,000 wounded. Admiral Chester W. Nimitz was responsible for planning a series of some of the most famous naval battles in history. Japan’s main carriers were sunk during the Battle of Midway, and the Americans seized the initiative against the entrenched Japanese forces. The Pacific War became one of island hopping, moving air bases closer and closer to Japan. With its merchant fleet sunk, Japan ran short of aviation gasoline and fuel oil, as the U.S. Navy in June 1944 captured islands within bombing range of the Japanese home islands. Strategic bombing destroyed all the major Japanese cities, as the U.S. captured Okinawa after heavy losses in spring 1945. With the atomic bombings of Hiroshima and Nagasaki and an invasion and Soviet intervention imminent, Japan surrendered. The war against Germany began with aid to Britain, her allies, and the Soviet Union, with the U.S. supplying munitions until it could ready an invasion force. The main invasion of France took place on June 6, 1944. Meanwhile, the U.S. Army Air Forces and the British Royal Air Force engaged in the area bombardment of German cities, systematically targeting German transportation links and synthetic oil plants, as it destroyed what was left of the Luftwaffe. With the Soviets unstoppable in the east, and the Allies unstoppable in the west, Germany was squeezed to death. Berlin fell to the Soviets in May 1945, and with Adolf Hitler dead, the Germans surrendered. The Soviet Union signed a non-aggression pact with Nazi Germany on 23 August 1939. In addition to stipulations of non-aggression, the treaty included a secret protocol that divided territories of Eastern Europe into German and Soviet “spheres of influence”, anticipating potential “territorial and political rearrangements” of these countries. In 1940-41 Stalin ignored reports of an Axis invasion. On 22 June 1941, Hitler launched an invasion of the Soviet Union. Stalin was confident that the total Allied war machine would eventually stop Germany, and with Lend Lease from the West, the Soviets stopped the Wehrmacht some 30 kilometers from Moscow. Over the next four years, the Soviet Union repulsed Axis offensives, such as at the Battle of Stalingrad and Battle of Kursk, and pressed forward to victory in large Soviet offensives such as the Vistula-Oder Offensive. Stalin began to listen to his generals more after Kursk. Under Hitler’s rule, Germany was transformed into a fascist state in which the Nazi Party took totalitarian control over nearly all aspects of life. The official name of the state was Deutsches Reich from 1933 to 1943 and Großdeutsches Reich (“Greater German Reich”) from 1943 to 1945. Nazi regime came to an end after the Allied Powers defeated Germany in May 1945, ending World War II in Europe. Beginning in the late 1930s, Nazi Germany made increasingly aggressive territorial demands, threatening war if they were not met. Austria and Czechoslovakia fell in 1938 and 1939. Hitler made a non-aggression pact with Joseph Stalin and invaded Poland in September 1939, launching World War II in Europe. In alliance with Italy and smaller Axis powers, Germany conquered most of Europe by 1940 and threatened Great Britain. Reichskommissariats took control of conquered areas, and a German administration was established in what was left of Poland. Jews and others deemed undesirable were imprisoned, murdered in Nazi concentration camps and extermination camps, or shot. After the German invasion of the Soviet Union in 1941, the tide gradually turned against the Nazis, who suffered major military defeats in 1943. Large-scale aerial bombing of Germany escalated in 1944, and the Axis powers were pushed back in Eastern and Southern Europe. Following the Allied invasion of France, Germany was conquered by the Soviet Union from the east and the other Allied powers from the west and capitulated within a year. Hitler’s refusal to admit defeat led to massive destruction of German infrastructure and additional war-related deaths in the closing months of the war. When the United Kingdom declared war on Nazi Germany at the outset of World War II, the British Empire was a global superpower, with direct or de facto political and economic control of 25% of the world’s population, and 30% of its land mass. The contribution of the British Empire and Commonwealth in terms of manpower and materiel was critical to the Allied war effort. Close to 15 million serving men and women, fought across Europe, Africa, Asia, and in the Mediterranean Sea and the Atlantic, Indian, Pacific and Arctic Oceans. 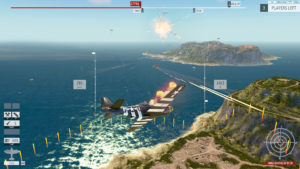 Commonwealth airforces fought the Luftwaffe to a standstill over Britain, and its armies fought and destroyed Italian forces in North and East Africa and occupied several overseas colonies of German-occupied European nations. The Commonwealth defeated, held back or slowed the Axis powers for three years while mobilizing their globally integrated economy, military, and industrial infrastructure.These efforts came at the cost of 150,000 military deaths, 400,000 wounded, 100,000 prisoners, over 300,000 civilian deaths, and the loss of 70 major warships, 39 submarines, 3,500 aircraft, 1,100 tanks and 65,000 vehicles. Britain became the nucleus of the Allied war effort in Europe. Canada delivered almost $4 billion in direct financial aid to the United Kingdom, while Australia and New Zealand began shifting to domestic production to provide material aid to US forces in the Pacific. Following the US entry into the war in December 1941, the Commonwealth and United States coordinated their military efforts and resources globally. Having already terrorized and destroyed areas of mainland China before the push to take over other territories in Southeast Asia, Japan began a diplomatic campaign to secure allies. In September 1940, Germany, Italy, and Japan became allies under the Tripartite Pact. As Japan worked to increase its imports through economic agreements with French and Dutch colonies, the United States, Great Britain, and the Netherlands began embargo of gasoline, aviation gas, scrap metal, steel and other essential building materials. After the Japanese attack on Pearl Harbor, the U.S., United Kingdom and other Allies declared war on Japan. The war spread throughout the Pacific region as Japan had initial success in its military campaign. However, in 1943 the hard-fought campaigns at the battles of Buna-Gona, the Tarawa, the Philippine Sea, Leyte Gulf, Iwo Jima, Okinawa, and others resulted in horrific casualties, mostly on the Japanese side, and produced further Japanese retreats. On August 6 and August 9, 1945, the U.S. dropped two atomic bombs on Hiroshima and Nagasaki. An estimated 150,000–246,000 people died as a direct result of these two bombings, during which the Soviet Union entered the war against Japan. Japan surrendered on August 15, 1945, and a formal Instrument of Surrender was signed on September 2, 1945, on the battleship USS Missouri in Tokyo Bay. The surrender was accepted, from a Japanese delegation led by Mamoru Shigemitsu, by General Douglas MacArthur, as Supreme Allied Commander, along with representatives of each Allied nation. 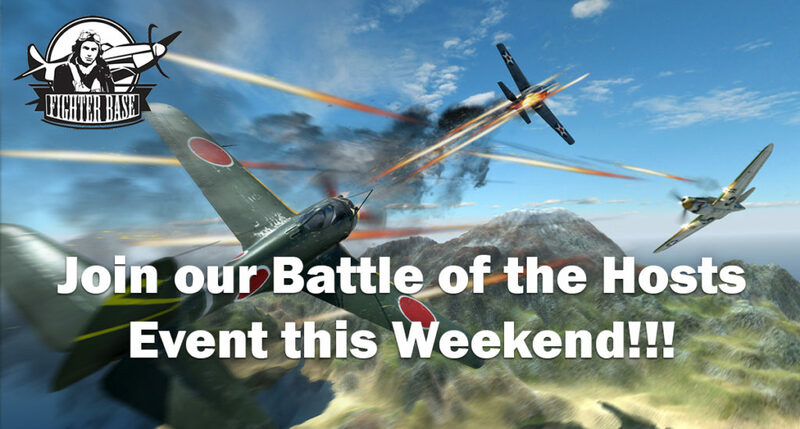 Headquarters – The weekend of July 8-9 promises to be a big one in the Fighter Base skies with the launch of the first official version of Fighter Base. Look for a variety of both individual and squad events! So get in touch with your comrades, get your joystick dusted off and get ready to fly! Events will be announced over the coming two weeks and will be available to all pilots around the world. Version 0.76 was published on June 23rd and is now available to the general public. Find it at the launch page . Make sure you are ready for the big weekend! Welcome to our weekly update for the week of March 27, 2017. With the Ides of March firmly in the rear mirror and April fool’s day around the corner it seems like winter is finally coming to an end which means that Fighter Base will soon be truly soaring. Much of this week was devoted to getting team rooms set up and working so I hope you will try them out this weekend. With team rooms we now have scoring on the way and with scoring come ranks. Just remember that ranks will be reset several times while we refine and debug scoring so please don’t get too attached to your ranks, stars and scores. See you in the skies of Fighter Base! Introducing the new and improved CHAT SYSTEM! We’re progressively introducing the scoring and stats so for now you’ll see a very limited implementation but come back regularly to see if there’s a new build as we will release several before 0.74. Note that in the Training Arena the scores will never get updated so this will become the safe room where beginners can learn and enjoy the basics of combat flight without being targeted by seasoned aces! Of course, we also fixed some bugs. One of those prevented new players from joining a battle with too many active players. Whenever you experience an issue with the game please send us the logs so we can identify and fix the issue. If you experience a crash then please open the log file folder (just paste %USERPROFILE%\AppData\Roaming\Fighter Base LLC\Fighter Base in the address bar at the top of any windows folder – not the web browser). You will find a sub-folder named with the date and time of the crash, please ZIP it and send it to us. 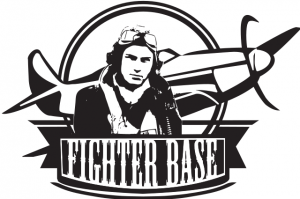 If you want to have direct input, and possibly influence the development of Fighter Base, please join the official Fighter Base Volunteer QA Team! Not only will we prioritize your feedback, but you’ll also get the opportunity to try new features before they go public! The Italian heavy cruiser Bolzano under attack by Swordfish of the Fleet Air Arm on 28th March 1941. The photograph taken from the second aircraft shows the splash of a torpedo entering the water. Air reconnaissance on the 27th March reported a force of enemy warships to the eastward of Sicily steering east. On the morning of the 28th March our light forces sighted one Littorio class battleship, accompanied by cruisers, to the south-west of Crete steering south-east, while air reconnaissance reported two battleships, cruisers and destroyers to the north of this position. On being sighted the enemy turned westward, proceeding at high speed. During the day the Littorio class battleship was repeatedly and successfully attacked with torpedoes by the Fleet air arm which caused serious damage. A successful attack was also made by bombers of the R.A.F. on cruisers and destroyers. The loss of speed resulting from these air attacks enabled our heavier ships to gain contact with the enemy at dusk, and a short but decisive action took place, resulting in the loss of three enemy 8-inch cruisers (Pola, Zara and Fiume) and two destroyers, Vincenzo Gioberti and Maestrale. It is probable that the 6-inch cruiser Giovanni Delle Bancle Nere and one other destroyer were also sunk. Two dive-bombers were shot down during daylight operations. Apart from three Naval aircraft which are missing, no damage or casualties were sustained by any of our ships. On the morning of the 29th nearly a thousand Italian survivors were rescued, which number would have been considerably increased had not German bombers attacked the rescuing ships. The Commander-in-Chief informed the Chief of the Italian Naval Staff of the position of the survivors, which he had been forced to abandon, and suggested that a hospital ship should be sent. A reply of thanks was received indicating that the hospital ship Piscana had already sailed. Greek destroyers which were rushed through the Corinth Canal arrived too late to take part in the action, but assisted to pick up survivors. Opposing forces consisted of British : three battleships, one aircraft carrier, four cruisers and twelve destroyers; Italian : three battleships, eleven cruisers and fourteen destroyers.